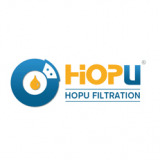 Why do we choose oil purifier? After a period of operation, owing to its exposal to oxygen and mixed with water, copper and iron and other foreign materials and high working temperature acceleration , transformer oil will oxidize and lose its original property and cannot be used effectively again. 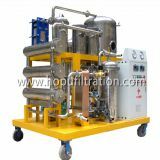 So HUHU oil purifiers can efficiently remove water, dirt, gases and other foreign impurities from oil, such as de-electrical oil, turbine oil, lubricating oil, engine oil, hydraulic oil, compression oil, mechanical oil, quenching oil, heat conducting oil, gear oil etc; so as to maintain its lubricating and insulating property, then to reduce components wear, and cut down oil expenses. 1. The model TYA is widely used in the fields of mechanism, metallurgy, mine, petroleum, chemical etc. 2. The unit can purify various kinds of lubricants as hydraulic oil, machinery oil, coolant oil, refrigerator oil, gear oil, gasoline engine oil, diesel engine oil, heat treating oil, etc. 3. The unit can quickly remove free and dissolved water, gases, impurities and volatile matter like ammonia gases from lubricants, increase used lubricants quality and recover performance to guarantee the correct working performance of hydraulic system, power system, and lubrication system. 1. With strong impurities filtration ability and large-area, mass and deep precision filtration material can remove the tiny and fine impurities from used lubricants. With PM filter can filter off ferreous impurities. 2. 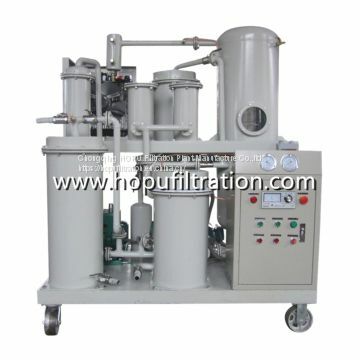 Unique degassing and dewatering system, adopts mature film evaporation and 3D flash distillation technology, and multi-stage oil water separating technology, can quickly remove free and dissolved water and gases. 3. Electrical heating device is the optimized pipeline design, to ensure the unique heating and stable oil temperature. 4. 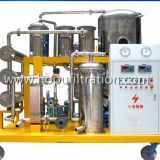 Automatic constant temperature control device, automatic liquid level control device, automatic defoaming device, automatic pressure protection device and excellent configuration can ensure the equipment in high performance. 5. Work online with unattended operation and the indicator lights display the running status. 6. The complete unit adopts the safety interlock device. The discharge oil pump, vacuum pump are interlock to the heating device to avoid adverse effect of misuse. 7. Compact design, low noise, easy operation, longtime free maintenance, low power consumption, running cost saving. 1. The unit can adopt PLC intelligent control device with touch screen operation and dynamic display as customer's requirements. 2. The unit can be designed as mobile, fixed and trailer models. 3. The unit can be designed as totally enclosed type, canopy type and open wide type. 4. The unit can be arbitrary choice of equipment color according to the customer's needs.